New York, NY - The Association for Neighborhood & Housing Development (ANHD) in collaboration with Make the Road NY and the New York Immigration Coalition is proud to launch the "ICE OUT" initiative. Today's immigration and deportation policies have galvanized community-based organizations, non-profit developers, and tenant groups to stand up and protect vulnerable immigrant tenants who live in their buildings and communities. 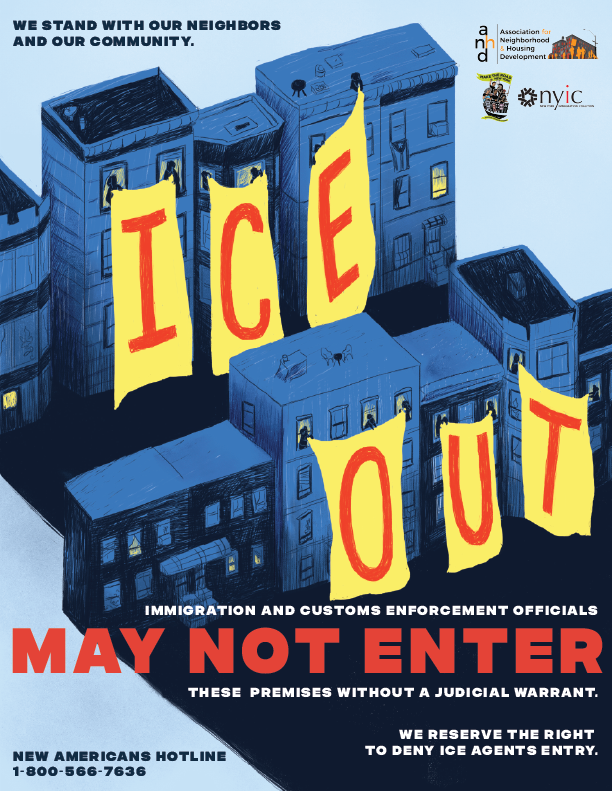 ICE OUT conveys the clear message that Immigration and Custom Enforcement (ICE) officers are not allowed to enter apartment buildings and community spaces without a judicial warrant. This crucial yet often overlooked right protects undocumented tenants in apartment dense-areas like New York City. The ICE OUT partnership is determined to spread this message. 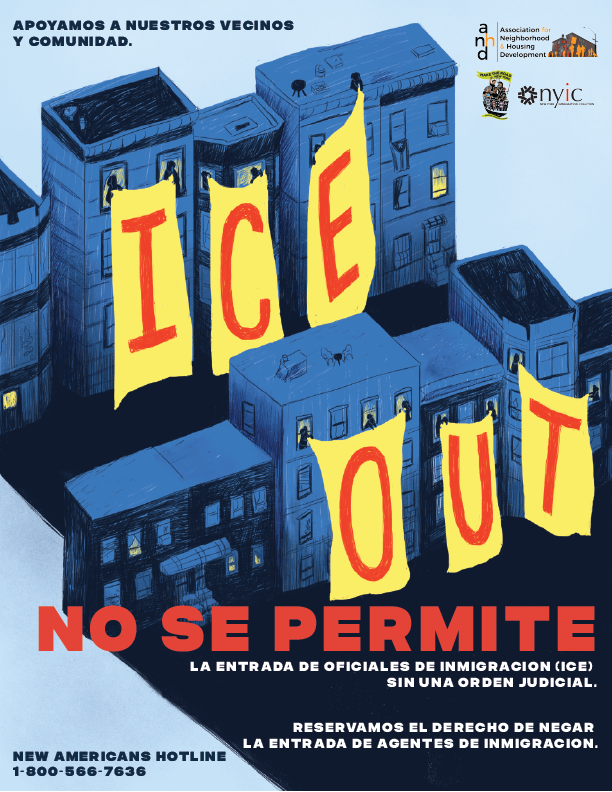 With posters placed in the entrances of buildings across the five boroughs, ICE OUT is a visually strong message of community resistance and solidarity. ANHD's nonprofit housing developers own tens of thousands of units across the city and are among the leading advocates pushing for the safety of their immigrant tenants. The initiative establishes that New Yorkers will stand up for their neighbors with this clear message that ICE is not welcome in our homes and in our communities. "With the current state of immigration and deportation policies, ANHD's nonprofit developers, tenants' rights groups, and community organizations are here to say that we will protect our tenants and our neighbors. ANHD's nonprofit developers own tens of thousands of units across the city and are taking a stand to protect vulnerable immigrant tenants who live in their buildings. ICE OUT is a clear message of community resistance and solidarity at the core of what ANHD and our member groups stand for," said Benjamin Dulchin, Executive Director of ANHD. "New Yorkers aren't going to let this administration terrorize our homes and community spaces. We are here to send a clear message: there is no place for ICE in our New York," said Steven Choi, Executive Director of the New York Immigration Coalition. "Fifth Avenue Committee is proud to stand with immigrants, advocates and tenants to assert our rights and protect undocumented tenants from unlawful enforcement activities in our communities. Harassment and intimidation of any kind must be resisted, and hard fought rights in our democratic society protected," said Michelle de la Uz, Executive Director of Fifth Avenue Committee. "At Spaceworks, tenants agree to practice communal care to ensure our spaces are safe and welcoming to all. We can think of no higher manifestation of this value than protecting your fellow New Yorkers' right to be in their own space without being criminalized. We are proud to support this important campaign and share its message with our community," said Risa Shoup, Executive Director of Spaceworks. Yaritza Mendez, Immigration & Civil Rights Coordinator at Make the Road New York, said, "There has been an alarming number of incidents where ICE agents have forcefully entered homes, without warrants and without identifying themselves, seeking to arrest immigrants and tear families apart. These ICE OUT materials send a clear message: ICE is not welcome in our homes and in our communities. With this initiative, our communities will continue to stand together against Trump's mass deportation agenda, as we continue tirelessly to protect and defend the rights of all New Yorkers and call to abolish ICE."